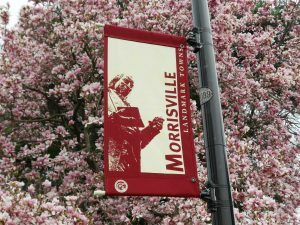 Morrisville Pennsylvania is a quaint little Borough of approximately two square miles. Named for Robert Morris, financier of the American Revolution, the Borough of Morrisville is located at the falls of the Delaware River across from Trenton. Historically, the town has strong ties to both Trenton and Philadelphia. Originally a village located in Falls Township until it was partioned as a Borough by the Pennsylvania Legislature in 1804. Morrisville is home to: Graystones, the site of the first land purchase in Pennsylvania; Williamson Park, a great site for recreation and outdoor activities; Summerseat, the 1765 Georgian mansion that once served as Washington’s headquarters, and the Actors’ Net of Bucks County, a year-round non-equity theatre company, to name a few.